When it comes to getting a good sleep, your mattress plays an important role. It can affect how well you sleep at night and how well you feel when you wake up. If you mattress does not offer enough comfort or support, you may not sleep well at night and as a result you may not feel rested in the morning. If you are suffering from sleep disruptions, discomfort or are waking up sore and still tired, it may be time to choose a new mattress. A latex mattress may be a good option. Always take your time and consider your options when choosing the best latex mattress. A good mattress should be comfortable to sleep on but also offer adequate support for your body. If your mattress does not offer the right support, your body may lay to limp while you sleep and your muscles, joints, and spine can become weak and sore. Too much support can put too much pressure on your body and cause your joints to hurt and even cause you to wake up several times during the night to adjust you sleep position. The best latex mattress will provide just the right amount of comfort and support. Everyone has different preferences and needs when it comes to mattress firmness, so it is important to consider your own wants and needs before you start shopping. You have a lot of options when it comes to choosing a mattress material. Many people prefer latex mattresses because of their many benefits and how they compare to other mattress types. Latex mattresses are durable and can last up to 20 years with proper care. Unlike other mattresses, latex mattresses instantly bounce back into shape once pressure is removed. Latex mattresses control the temperature better, helping you stay cool or warm at night. Latex is moisture and mold resistant. Movement and noise are easily absorbed by a latex mattress. If you suffer from skin irritations, allergies, sleep disruption caused by body temperature or a restless partner, a latex mattress can help you with these problems. Latex mattresses are good quality mattresses available for an affordable price. A mattress can be a big purchase for many people, and that is why you need to take your time when choosing one. If you have, decide that a latex mattress is the right option for you consider these tips to help you find the best one for your needs. Cost is a big factor for most people, so it is important to set a budget when shopping for a latex mattress. There are latex mattresses that fall into all different price ranges, so as long as your budget is realistic, you should be able to find one to fit it. Just remember that price is not always a reflection of quality, but you do often get what you pay for when it comes to these products. When you start shopping for the best latex mattress, you will find that you have the option of choosing synthetic latex or natural latex. Both types have their pros and cons, and it comes down to a matter of preference. Synthetic latex is often more affordable but can be made from plastics and chemicals. Natural latex is made from the sap of a rubber tree and is better for the environment. It can be easy to get distracted by a lot of complicated design features. You may find some of these features convenient, but others may get in the way of your dream sleep. When choosing a mattress design, make sure you are choosing features that you will use or need. Sometimes a simple and clean design can be the best option. A mattress cover can be your best friend, especially when it comes time to clean your mattress. If you think you will need to do more than just spot clean your latex mattress, look for one with a removable cover. The cover should also be made of breathable materials and be easy to take off the mattress and put back on it. Purchasing your mattress from a reputable company is important and could be the difference between an enjoyable shopping experience and a terrible one. Read reviews of the company you are buying from as well as the mattresses you are interested in before you make your purchase. Always compare your options carefully and don’t be afraid to ask friends and family members about their latex mattresses and their experienced with them. This mattress is a 10 - inch mattress that comes with a bamboo cover. It is composed of Talalay Latex and a high-density foam base. Available in five different firmness options, the Ultimate Dreams Latex Mattress offers comfortable sleeping for everyone. Late foam can reduce high-pressure areas that shut off capillary blood flow, causing your sleep to be disturbed and causing you to change sleeping positions throughout the night. The latex mattress is also breathable meaning it does not retain too much heat and cause the body to become hot or overheated. This mattress is great for consumers who are ready for a new mattress that is easy to care for yet also high quality and comfortable. 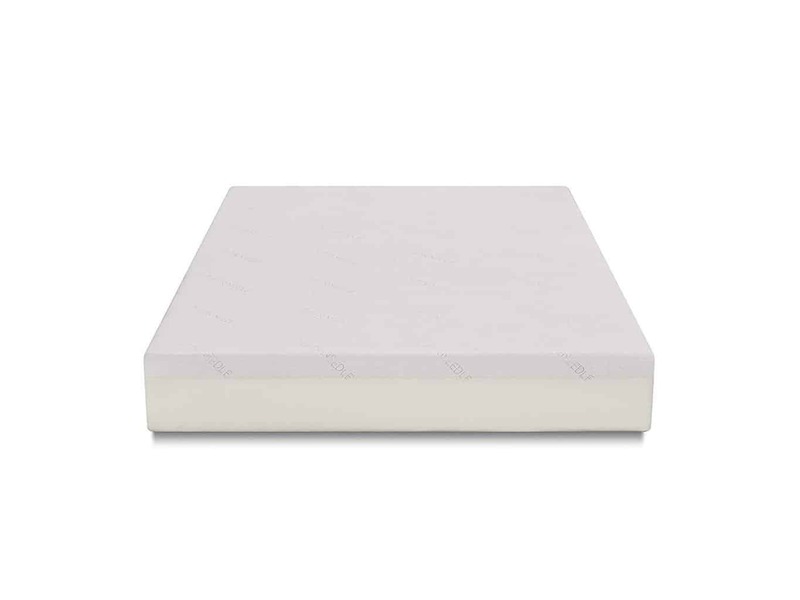 The Tuft & Needle 10-Inch Mattress is designed to distribute body weight evenly, so you never have to worry about your pressure points being under too much pressure or not being supported. The mattress is flexible, making it easy to get in and out of and to sit up and move around in, but that movement does not transfer from one partner to the other. This means no more waking up every time your partner moves or gets out of bed for a glass of water. This American-made product also comes with a 10-year warranty. With a flippable 2-sided latex mattress that is firm on one side and soft on the other, you can control your comfort level and how well you sleep. The Roma All Latex Mattress is covered with a 1.5" of CertiPUR foam quilted cover that offers a comfortable sleeping surface. The mattress is designed to last and does not sag or sink in certain spots even after years of use. It is available in four different sizes, and the mattress and base are sold separately. With eight different size options and motion reduction capabilities, the Naturale Latex Mattress offers something for everyone. This mattress is considered a medium firmness, meaning it is not too hard or too soft and provides the right combination of support and comfort. This mattress affordable, so much so that you may find yourself buying a second one for a guest room or your RV. If you suffer from back pain, restlessness or have a partner who moves around a lot at night, the Naturale Latex Mattress may be the solution to your nighttime problems. The Ecstasy Latex Mattress offer double airflow comfort, insect and mold resistance and a medium-firmness. It features a 2'' of super soft polyurethane top with a 0.8 oz. FR fiber filling. The mattress is 100% American made and is fire resistant. It is affordable and perfect for dorm rooms, teen and children's rooms or guest bedrooms.